Dylan Otto Krider of Houston, Texas won the grand prize in this year's L. Ron Hubbard Writers of the Future contest, and Irena Yankova Dimitrova from Bulgaria won the Illustrators grand prize. 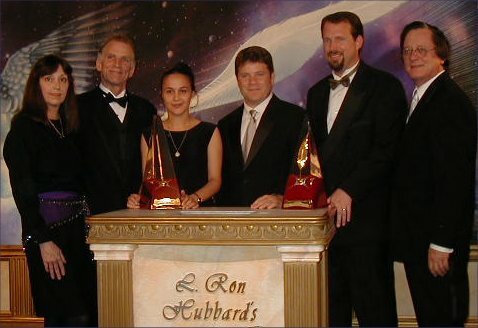 The prizes were announced at the 18th Annual L. Ron Hubbard Achievement Awards, held August 17, 2002 at the L. Ron Hubbard Gallery in Hollywood. Twenty-seven finalists, 17 writers and 10 artists, attended the event, which was hosted by actor Jim Meskimen. Another actor, Sean Astin, who plays the hobbit Samwise 'Sam' Gamgee in The Lord of the Rings films, helped present the grand prize awards. The evening's ceremony also included the unveiling of the annual anthology containing work by this year's winners and finalists, L. Ron Hubbard Presents Writers of the Future, Volume XVIII, with a cover by artist judge Frank Frazetta. The contests are held quarterly, and are open to writers with no more than three published stories or one novelette in any medium, and illustrators with no more than three story illustrations or one color piece in a nationally distributed medium. Each quarterly writers contest results in first, second, and third place winners, previously announced; the four first place winners are then eligible for the grand prize "Gold Award", which is announced at the awards ceremony. Contest judges in attedance were, for the writers, Kevin J. Anderson, Doug Beason, Hal Clement, Nina Kiriki Hoffman, Eric Kotani, Frederik Pohl, Jerry Pournelle, Tim Powers, and K.D. 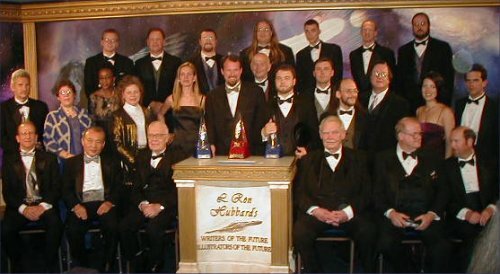 Wentworth; not in attendance were Gregory Benford, Algis Budrys, Larry Niven, Robert Silverberg, Orson Scott Card, Anne McCaffrey, Andre Norton, Charles Sheffield, and Jack Williamson. Artist judges in attendance were Frank Kelly Freas, Laura Brodian Freas, Judith Holman, Ron Lindahn, Val Lakey Lindahn, and Sergey Poyarkov; not in attendance were Edd Cartier, Leo & Diane Dillon, Bob Eggleton, Frank Frazetta, Vincent Di Fate, Will Eisner, and H.R. Van Dongen. For further information about the contest, see www.writersofthefuture.com. 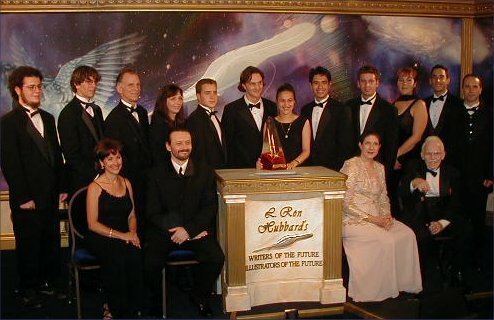 Writer finalists and judges (j). Top row: Seppo Kurki, Tim Myers, Lee Battersby, Drew Morby, Leon J. West, Woody O. Carsky-Wilson, Joel Best. Middle row: Ray Roberts, Nina Kiriki Hoffman (j), Nnedi Okorafor, K.D. Wentworth (j), Susan Fry, Dylan Otto Krider, Carl Frederick, Patrick Rothfuss, Tom Brennan, David D. Levine, Tim Powers (j), Jae Brim, Ari Goelman. Seated: judges Doug Beason, Eric Kotani, Hal Clement, Frederik Pohl, Jerry Pournelle, Kevin J. Anderson. Not present: finalist Aimee C. Amodio. Artist finalists and judges (j): Standing: Anthony Arutunian, David C. Mullins, Ron Lindahn (j), Val Lakey Lindahn (j), Brian Hailes, Hristo Dimitrov Ginev, Irena Yankova Dimitrova, Jason Pastrana, Rey Rosario, Darlene Gait, John Kolbek, Fritz Peters. Front: judges Judith Holman, Segey Poyarkov, Laura Brodian Freas, Frank Kelly Freas. Not present: finalist C.M. Wolf.